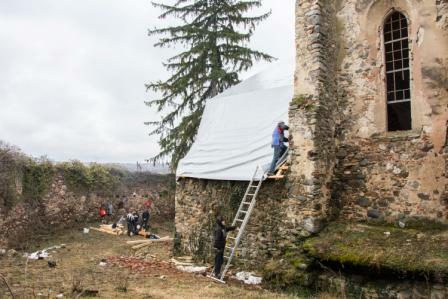 At the beginning of February, the so very urgent and important securing work could be carried out at the fortified church in Dobârca. After many discussions and site visits with local actors and various construction companies, it was now possible to erect an emergency roof. Instead of the collapsed choir roof, a wooden construction was erected that carries a specially made tarpaulin. In this way the further penetration of moisture into the building can be prevented. Especially endangered parts of the triumphal arch as well as load-bearing parts in the nave were additionally supported. The construction department of the Superior Consistory supported the plans for the emergency intervention. 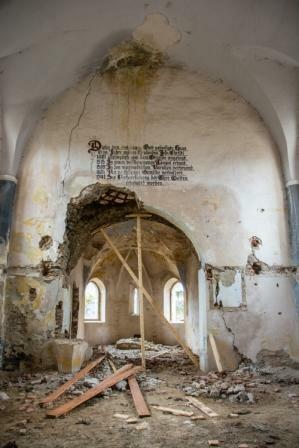 This became a necessary consequence as due to vandalism and theft the fortified church fell visibly to ruin and finally the choir roof collapsed. We would like to thank the company S.C. Horanca Ighis Construct SRL for the work and all donors for their support. In addition to private individuals, these include the Anglo-Romanian Trust for Traditional Architecture, the Association Kulturerbe Kirchenburgen and the Association of Transylvanian Saxons in Switzerland. 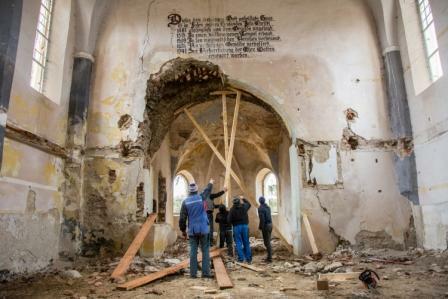 The emergency repairs should only be the first step towards the restoration of the fortified church. As early as 2018, static and geological investigations were carried out on the building as part of a joint program sponsored by the German Federal Commissioner for Culture and the Media. 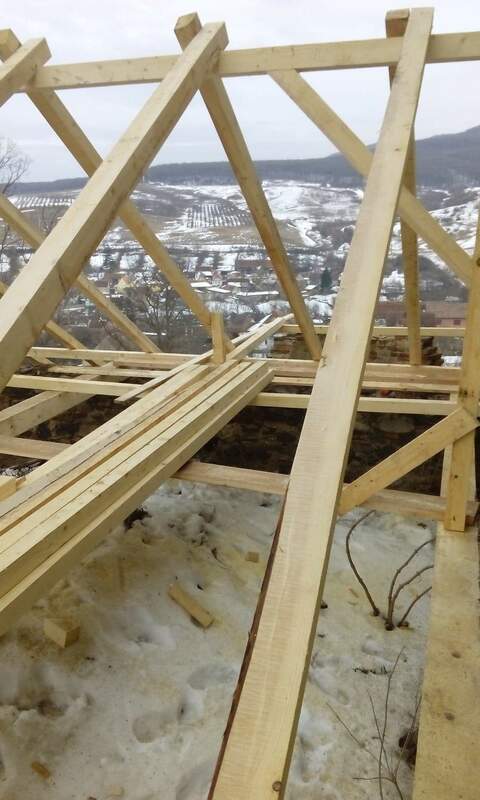 From the results, the structural engineer Csaba Bodor developed a report on stability, which also contains proposals for measures to further stabilize the structure. As the nave has several endangered areas and urgent safety work must now also be carried out in this area, we continue to depend on your support. Please help us with your donation. The provisional construction and the attached tarpaulin are to be classified as a good provisional interim solution. 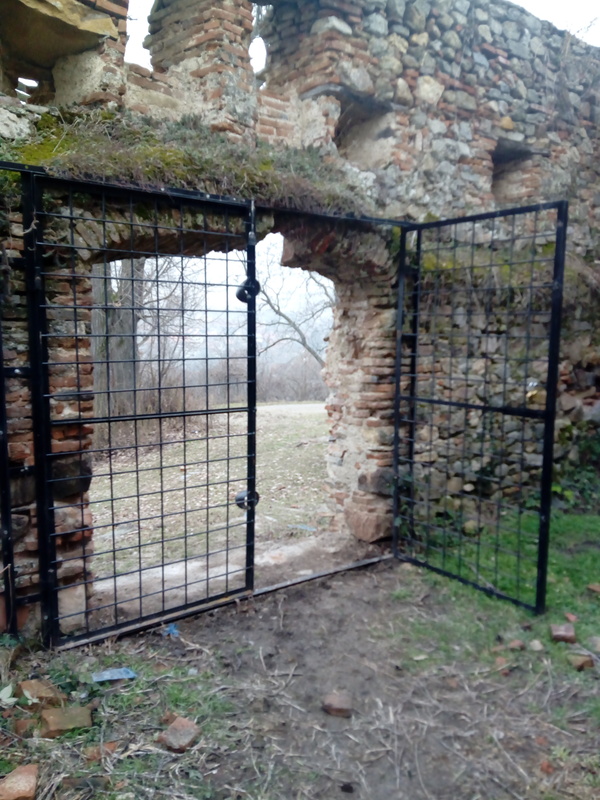 The further procedure in Dobârca will depend on the existence of a long-term resident initiative, group of persons or person – only in this way can the future of the fortified church be secured.